It's snowing outside and we are stuck indoors. What better thing to make for tea but those hot, sticky, flaky, sweet and uber yummy buns! Now let's start making them. First, using an electric mixer, combine the 6 tbsp & 1/6 cup of brown sugar together. The mixture would be lumpy but that's fine.....'cos it's all gonna melt into a gooey yummy-ness once it gets into the oven! Divide the mixture evenly into the 6-hole muffin tray. Sprinkle the walnuts over the mixture. You can use other nuts like pecan, almonds etc if you don't like walnuts. Once that's done, I started prepping the puff pastry (which has already been defrosted to room temperature). I unrolled the puff pastry and brushed 1 tbsp of melted butter all over it. This is the frozen puff pastry that I use all the time. ......then I added the golden raisins. The next step will be to roll up the puff pastry. It's important to roll it firmly but do not press too hard as that might prevent the puff pastry from rising nicely. Then, cut the rolled pastry into 6 equal parts. Press each cut piece of pastry into the muffin pan. Pop the tray into the pre-heated oven (400F) and bake for approx 25-28min. I placed the muffin pan on the top most rack in the oven so that the buttery mixture at the bottom of the pan will not burn. Once the buns are cooked....turn them out onto a lined baking sheet and cool them slightly before eating them. But do eat them fresh out of the oven for the best flavors and texture. Try making them and you won't regret it! But let's just keep them for those really special days 'cos these babies are extremely SINFUL and addictive!! What a great recipe...Call me silly but I never knew how to get all that sticky delishiousness on top of the buns! 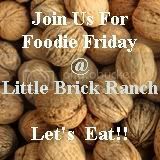 :) Thanks for linking up to Foodie Friday. I hope to see you again next week! !